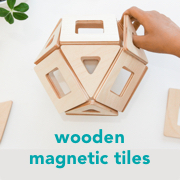 Etsy is one of the best places to find Montessori infant materials. The materials are handmade often by those who have studied Montessori. 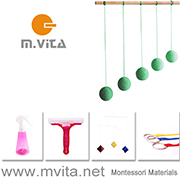 I've found some really beautiful Montessori rattles, some of these have been designed specifically for Montessori environments while other are just really lovely rattles made from natural materials. 1. Bell Rattle (sold in a newborn pack) at Beginning Montessori. Small and light enough for a young child to grasp, recommended as a first rattle. 2. Cube Rattle at Wooden Caterpillar. 3. Bell Cylinder at Beginning Montessori. 4. Wooden Baby Rattle at Essential Montessori. 5. Black and White Crochet Rattle (from three months) at Pinkhouse. 6. Rainbow Wooden Rattle at Beckman Woodworks. 7. Creamy Soft Crochet Rattle at Pinkhouse. I love the crochet texture. 8. Natural Wooden Rattle at Keepsake Toys. 9. Wooden Teether/Rattle at Freja Toys. 10. Tambourine Rattle at Essential Montessori. 11. Silicone Teether/Rattle at Ti Amo Mama. 12. Wooden Crochet Teether/Rattle at Bubuline. 13. Woven Ball Rattle at Madweaver Boutique. This is really beautiful. 15. Sunshine Rattle with Bells at Mary Magic Work. Rolling and ball rattles are good for a child who has started reaching and moving (creeping) or sitting and working with two hands. If you are looking for rattles on Etsy made specifically in Australia have a look at these Wooden Maracas or Silicone Teethers/Rattles.